40 members of staff at WB The Creative Jewellery Group have volunteered to take part in a Business Improvements Techniques (BIT) Course being run for the company by PERA Training. 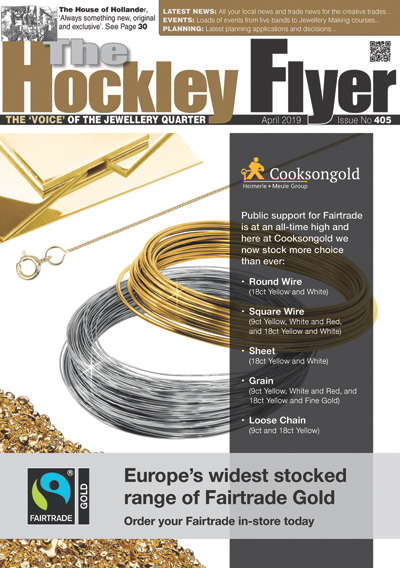 The Group is believed to be the only business in the jewellery industry to go down this route. Those participating are all based at the Group’s headquarters in Birmingham and are drawn from the precious jewellery brand Domino and from the casting, 3D printing and bespoke manufacturing company Weston Beamor. If all goes well, the initiative will eventually be expanded to include staff at the Group’s third company Gecko which is based in Essex. PERA Training is a long-established, independent training provider which has an excellent track record of working with large, blue-chip engineering businesses. The aim of the course, which provides a useful qualification for staff educated to below degree level and is a strong alternative to a more conventional apprenticeship, is to help those who take part learn how to operate within the supply chain and to encourage them to participate in problem solving within the company. Group managing director Andrew Morton, who has instigated the course, is enthusiastic about the benefits he believes it will bring not simply to those who participate but also to the business. “We are confident that a well-trained and questioning workforce is a more productive and more motivated workforce,” he says. The course certainly represents a high-level of investment from the Group as each of the 40 people taking part will need to have five full days of intensive training during which they will be absent from the workplace for the entire week. This will be followed by one day of further training each month for the next twelve months. “The members of staff taking part have been divided into five teams drawn from different areas within the company so that each group includes people from the bench, from finance and from sales. This means that participants learn how other areas of the company operate and get to know the kind of work they do and the difficulties that their colleagues face,” explains Morton. Part of the PERA Training way is to get trainees to identify problems within their own area of the business and to work together with others in their group to solve them. Whilst it is still early days the programme is already paying dividends. “We are delighted with the feedback we are receiving and I am very pleased to say that the course has already thrown up a number of potential future leaders whose positive attitude has much impressed the tutors,” says Morton. For Marion Morgan, Executive Assistant to the Board of Directors, the course has been a real eye-opener. “Problem solving is a huge part of my job so I was very interested to get involved and to have the chance of interacting with other members of the company. It has been very challenging and interesting and has certainly made me realise how much one is capable of given the right tools and the self-confidence to communicate more effectively,” she commented. Richard Vinten, a CAD designer at Weston Beamor signed up to get a different perspective on the business for which he works and he wasn’t disappointed. “I come into work and do pretty much the same stuff day in and day out. Doing the BIT Course has opened eyes to the Group as a whole and broadened my understanding of the business flow. It has also invited me to question what I do and to wonder if there is a better way of doing it. I am already communicating more with people in other departments whose work impinges on my own but with whom I have not previously had much contact,” he commented. Gina Baldwin, who works in the casting and waxing department, is another staff member who has been thoroughly enthused by her first week with PERA Training. Gina was chosen to be ‘Team Leader’ of Group 4. This was the only one of the five groups to be made up solely of women and was also the group which won the ‘Business Challenge’ undertaken by all the groups and in which they were asked to assemble plastic motorbikes in the most effective and cost-effective way possible. “Our group had very different skill sets and we decided early on what our roles should be. We also decided to go for quality over quantity and I think that helped. It was a good learning experience and has really made me notice how things can be made more efficiently,” says Baldwin. 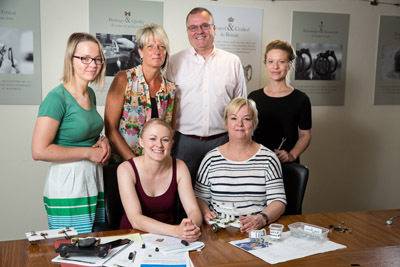 Ian Adams, a Vocational Education Training Officer at PERA Training who undertook the initial training for WB The Creative Jewellery Group was impressed by what he saw. “From an outsider’s perspective this is a fantastic business with an even better culture which shows the minute you walk through the door. Hopefully the BIT Course will help all those on the team, which is the most valuable asset that any company has, to look for any and all opportunities to improve even further,” he commented. Andrew Morton is convinced this will be the case. “Everyone concerned has made an excellent start and I am really looking forward to hearing what problems they will identify within their own working lives. I also have no doubt that their solutions to these will have a truly positive effect, not simply on how the effectively the Group operates but ultimately to our bottom line,” he concluded.